Professional racing car seat systems - SFI 39.1 advantage series. SFI 39.1 approved seats are mandated in the top 3 series of NASCAR, the NASCAR Modified Tour, ARCA and others series. 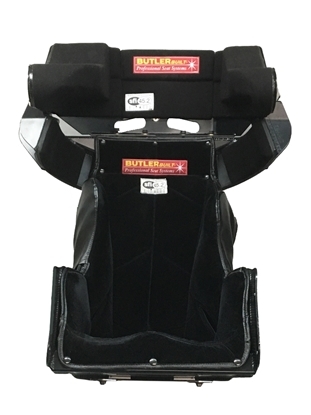 Our SFI 39.1 ADVANTAGE SERIES seat was the first seat to be added to the SFI approved manufacturers list and was the first SFI 39.1 seat to win a race in NASCAR history. The seat incorporates a strong, comprehensive head and shoulder support package to our already proven aluminum seating system. 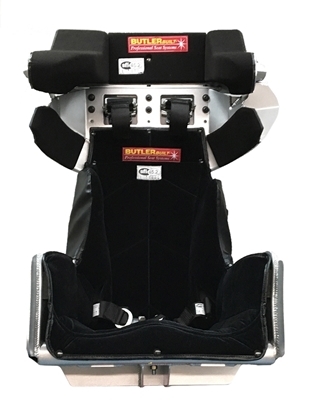 The ButlerBuilt SFI 39.1 Advantage Speedway now available in ALL BELTS version that allows the complete seat belt system to be mounted to the seat.